The 1920s is commonly referred to as the “Roaring Twenties” in Canada. As the narrative goes, the cultural scene exploded with jazz music and films, while industry and manufacturing grew, and Central Canada underwent an urban transformation. Preceding these boom years, Canadian veterans made their way back home after four long years of struggle and eventual victory between 1914 and 1918. The timing should have been perfect, as veterans would re-enter the job market just as the “roar” was about to begin. Upon closer inspection, however, the “Roaring Twenties” narrative is more myth than reality. The 1920s was a struggle for many Canadians, particularly veterans. Thousands of disabled ex-servicemen struggled to find work. Those afflicted with war neuroses––more commonly described at the time as “neurasthenia” or “shell-shock”––found employers and the general public unsympathetic to their sufferings. Even those who had more ‘visible’ disabilities, such as an amputated leg or a missing eye, encountered job discrimination, as employers tended to hire able-bodied men with the belief that they would be more productive. Compounding veterans’ disabilities and the job discrimination they encountered was the declining economy outside of the urban core of Canada. The economic downturn in Atlantic Canada accelerated, while out west the prairies entered a depression as the wheat economy collapsed. The repercussions of economic centralization in Canada were finally beginning to take a toll. Nowhere was this more apparent than in case of a Nova Scotian veteran named James McCallum. McCallum returned home after the war, hoping to reclaim his position in the local coal mine in Springhill, Nova Scotia. Yet, with the coal mine’s declining output, and McCallum’s respiratory issues and arthritic pain, he and his family greatly suffered. 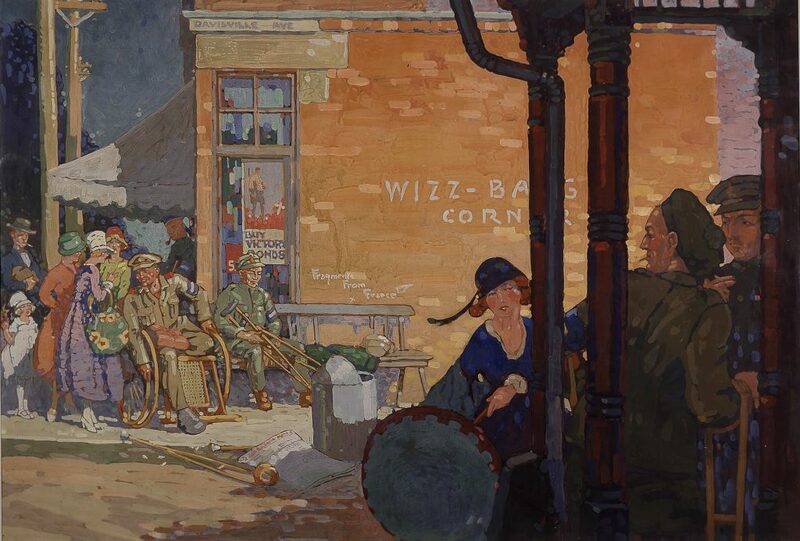 This painting, “A War Record,” depicts wounded veterans outside the Orthopaedic Military Hospital in Toronto. The graffiti “Whiz Bang Corner” is in reference to a place on the Western Front named after the enemy’s shells. By Stanley Francis Turner, Beaverbrook Collection of War Art, Canadian War Museum 19710261-0766. McCallum enlisted in June 1916, just two days before his forty-first birthday. He would have been one of the older soldiers in the Canadian Expeditionary Force, as the age requirement for recruits ranged between eighteen and forty-five. McCallum served for the remainder of the war, and was discharged in 1919. He returned home to Nova Scotia, and eventually, the Springhill coal mine. He was not the same man as he was before 1916. Immediately, McCallum began to experience occupational difficulties. He had been diagnosed with chronic bronchitis and his feet had become so badly deformed that he could not walk without immense pain. As a result, between May 1919 and June 1928, McCallum worked only 1533 days, while the mine’s operation days totaled 2154 days. War’s long shadow loomed large for the aging Nova Scotian miner. In this poster the amputee demonstrates his ability to work with a prosthetic hand. The caption “Once a Soldier Always a Man” indicates the pressure that some wounded veterans were under to demonstrate their masculinity and continue to provide for their families despite their injuries. 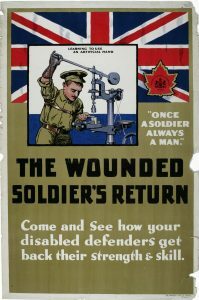 Rehabilitation Poster, Canadian War Museum, 19900076-845. After his application for a pension in 1926 was rejected, McCallum wrote a letter to the Board of Pension Commissioners (BPC): “I don’t think I got a square deal,” it read. “I was a soldier in the Great War for 3 years. I was in France & Flanders 19 months, my War record is good[;] as a private I won the Military Medal under shell fire.” McCallum was proud of his accomplishments overseas, and believed he should have been compensated. Yet it was not just because of his achievements that he expected a pension. According to McCallum, he raised a large family, “worked hard all [his] life,” and his war-aggravated disability kept him from providing for his family. “When the country was in danger I did the best I could,” he concluded in his letter, clearly disappointed, “but now when I ask for something they turn me down cold & hard.” It was a frustrating time for McCallum. By 1928, McCallum was no longer working in the coal mines. He was confined to his bed as his injuries had grown too grave and too painful. McCallum’s son, fed up with his father and the government for its refusal to award him a military pension, took to writing the BPC. In a series of letters, he outlined the hardships his family endured. One grievance was the general attitude of his father: “I care not what they do with my father,” he wrote. “He is always boasting of how happy he could be if he lived alone.” Another complaint was the meager wages of $3.50 per day he himself was receiving, which was to support his entire family, including his bedridden father. These low wages can be attributed to the financial struggles of the British Empire Steel Company (Besco), who took over steel and coal production in Nova Scotia in 1921. After only four years, it had run a deficit of nearly $6 million, and began to cut wages and reduce the labour force. McCallum’s son was one of the unfortunate coal miners who felt the effects of slashed wages. McCallum’s son, in several letters, also wrote of the numerous labour strikes at the Springhill mine, with workers speaking out against low wages and job cuts. Although the miners struck many times, and were able to successfully resist large wage reductions, the waning economy still impacted McCallum, his son, and their family for years. McCallum’s son’s largest grievance was that his father’s health was limiting his potential. “If it wasn’t for the mental condition of my father due to economic straits that our family is in I would leave this country behind & see if I could make my own future look brighter,” he wrote. McCallum’s son wanted to move to California, raise a family and make his fortune. His resentment stemmed from the fact that his father’s disability was robbing him of his own independence. Finally, in 1931, after a tribunal hearing, McCallum received the pension he felt he was deserved at nearly $20 per month. Yet, it appears that the domestic situation deteriorated after McCallum stopped working in 1928. He and his wife were no longer living together. When she died in 1944, McCallum brought two of his now-grown children back into his home, so that he could be cared for until his death eight years later. Unfortunately, many of the negative repercussions of the post-war period brought themselves to bear on James McCallum and his family. The decline of the coal industry in the Maritimes, and a lingering disability from the war that kept a breadwinner from taking care of his wife and children, came together to tear the family unit apart at the seams. The “Roaring Twenties” it may have been for some families, but for the McCallums, the decade was one of financial instability and domestic hostility. James McCallum #223323, Reel 125, Veterans Affairs Canada Pension Files, Laurier Centre for Military Strategic and Disarmament Studies Archives.